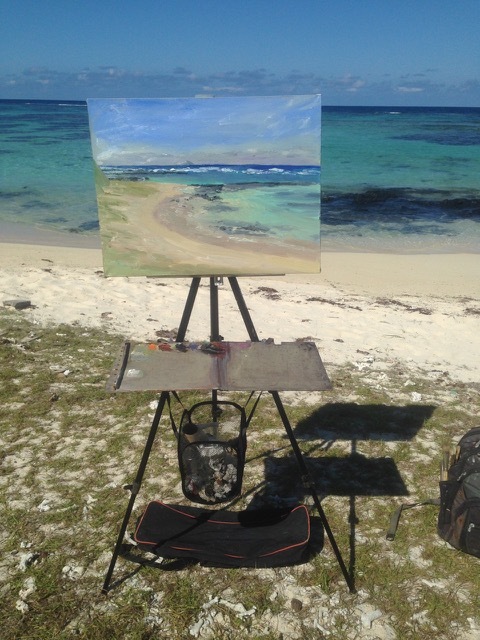 ​I did this painting on the East Coast of Mauritius, Trou d’Eau Douce. Mauritius is a tiny island in the Indian Ocean 200 miles to the east of Madagascar and over 2000 miles off the coast of Africa. This is where I live. 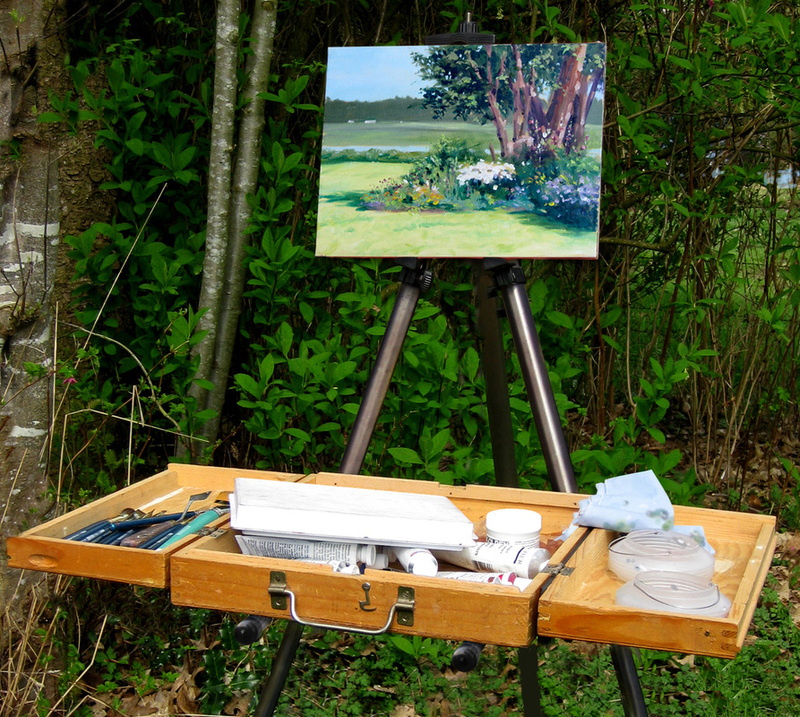 As you can see, I love my Easel Butler!!! 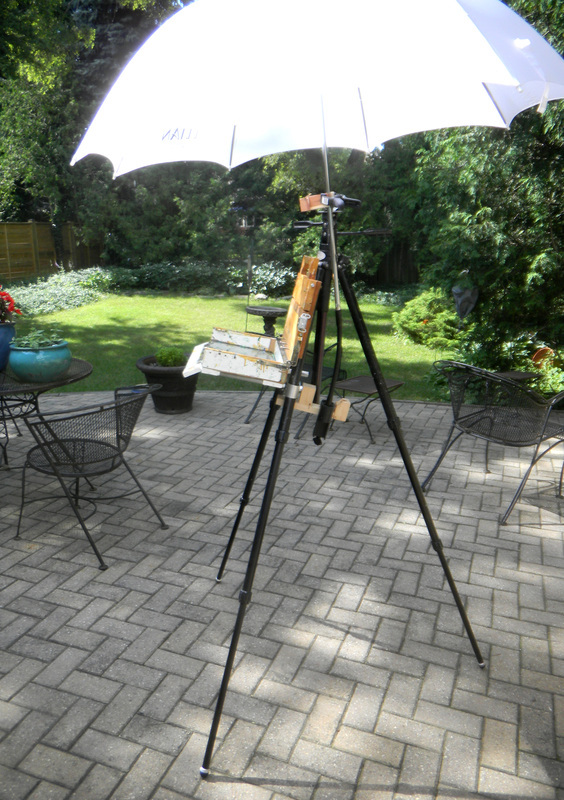 ...and am happy painting LARGE pictures on my tripod. 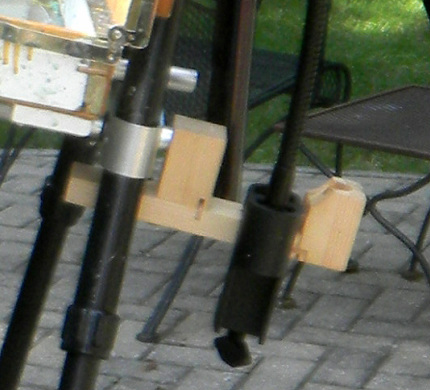 I have made a couple of clips to keep my palette attached and a couple of holes in the palette itself which is really helpfull in strong winds. Before I could get a chance to use Max, my husband absconded it for a 2-day painting trip at Natural Bridge. You can see it holding his palette here. He came back and said it worked perfectly. The Julian umbrella that I bought for $59 gets used. I don't have to worry about rocky terrain or other surfaces that are inhospitable for stake attachment umbrellas. The attachment is made from scrap wood and simply requires a 3/4 inch drill bit, cost of this bit is under $7 and needless to say, also appeals to my frugality. I used to think that I could take the sun for hours but now that I am 66, and paint in the desert, I'm not so sure. Many thanks to Ted Yao from Toronto, Canada for this ingenious umbrella holder add-on for Max! ◄◄◄ And here is a close-up of it for all of those analytically minded souls...like myself...who just have to see how that was done. ere in Ontario's Killarney Provincial Park on the north shore of Georgian Bay, Max is holding a 24 x 24" canvas while Ted paints a scene diagonally.